Birthday Cards Designer Software is useful to design and create Birthday cards with advance image designing objects. Advanced feature software is useful to create birthday card with use of different card designing objects including Line, Ellipse, Pencil, Rectangle, Text, Picture, Arc, Triangle and Star objects. 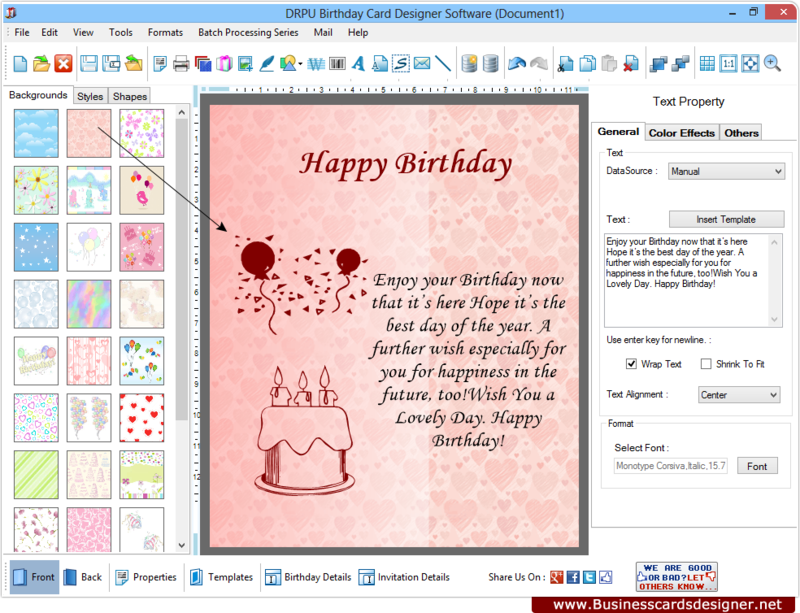 Software provides option to include variety of message using message templates (pre-defined messages provided with the software) useful while designing birthday cards. Software design and create Birthday Cards and invitation cards using different type of image designing tools including Line, Ellipse, Pencil, Rectangle, Text, Picture, Arc, Triangle and Star objects. Software creates Birthday Card with specific type of fold if required. Provide option to add WordArt text-styling feature to the Birthday Card. Provide option to start new Birthday Card format or edit existing Birthday Card format. Provide option to create Birthday Card using wizard or with blank format. Specify the color and background settings of Birthday Card including Solid Color, Gradient, Image and Style settings. Add text in variety of style include text feature property. Include message using message templates while creating birthday Cards. Select image from library during Birthday Card designing process. Data Set Series feature allows you to generate the multiple copies of Birthday Card with different text value. Option to print created Birthday Card using advance print settings.